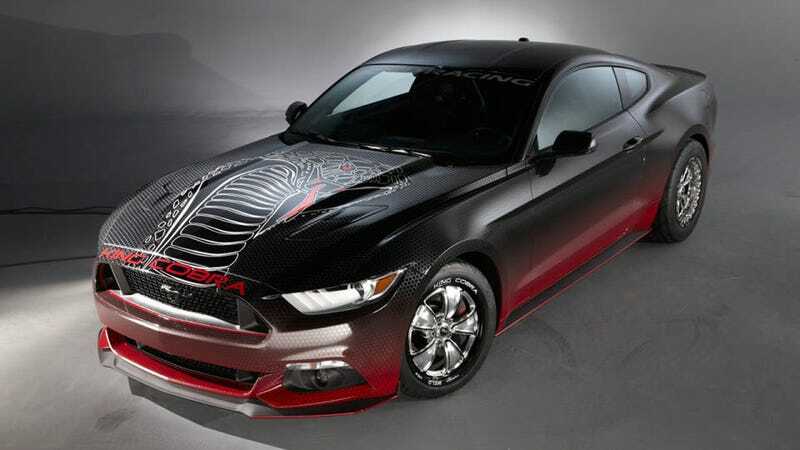 No, the 2015 Ford Mustang King Cobra unveiled at the SEMA show is not a Hellcat-fighter. Not really, because it's not a production car the way the Hellcat is. But if you equip your Mustang with all these Ford Racing parts, you'll be there. At last we know what yesterday's mysterious "King Cobra" Mustang is: it's a plethora of Ford Racing parts packages that, when combined, make the new pony car very powerful and very fast. This particular car comes loaded with their "Drag Pack," "Handling Pack," and "Super Pack" supercharger kit. Equipped with a 2.3-liter TVS/Roush supercharger, this 5.0-liter V8 gets more than 600 horsepower. And when it has drag radials, it can run the quarter mile in 10.97 seconds. Other tweaks from the three packages include heavy-duty half shafts, a rear sub-frame kit with high-performance bushings, a one-inch lower ride height due to a revised suspension, a stabilizer bar, high-flow fuel injectors, an intercooler, and a retuned ECU. That makes it, what, 20 times faster than the 1978 King Cobra? Something like that. As for the body, that's a snake skin wrap from 3M, according to our friends at Road & Track. I kind of like it, and the crazy hood graphics. It's not a King Cobra unless it's garish as hell.